Documentation pages for "Sphere 12/16"
Kilian Ochs was invited to ISEA 2011 with his futuristic analogue-digital hybrid "Sphere 12/16" which will be presented around Cumhuriyet Art Gallery in Taksim Square. "Sphere 12/16" will be featuring Joscha Steffens at ISEA 2011, who will perform together with Kilian Ochs. 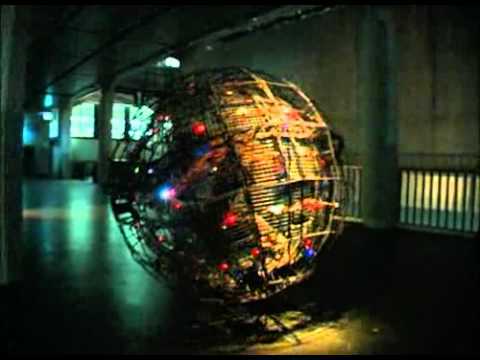 "Sphere 12/16" is a performative object and a music instrument. At ISEA, it will be the first time that the public can play the sphere on a small sensor piano which is connected to the electronics on the steel ball. Kilian Ochs was born in 1980, in Pforzheim (Germany). He grew up in a family of workers and technicians. His early interest for the questionable reality of pure logic, combined with a need for distinct expression, brought him to writing, and in 2002, with the age of 22, he was ready to start his studies in the Philosophy department of Hochschule für Gestaltung Karlsruhe. However, feeling the urge to get closer to the obstruction of materials, he decided to change the department after one semester, and studied Media Art. He graduated in 2010. For several years now, he has been dealing with an own theory of systems, and with the challenge to shape systematic procedures into material. With “Sphere 12/16”, one of his latest projects, he eventually built his first object which both theoretically and aesthetically achieves the goal of melting logical thoughts and resistant material together. The artist lives and works in Karlsruhe (Germany) and Tallinn (Estonia). Jan Kornett, and Jürgen Springer for taking the pictures. Special thanks to Leho Reiska and Erik Alalooga for their kind assistance during the manufacturing process. Thanks to Joscha Steffens for participating.